If you want to pass the Fundamentals of Engineering (FE) exam, the best thing you can do is enroll in a great FE exam prep course. Earning an FE license proves that you can commit to yourself, your future employer, and the public. Not to mention that the FE license is necessary to become a Professional Engineer. So which FE review course will help you pass the exam best? We have personally researched and compared all of the major FE study materials on the market so you don’t have to. Use our comparison chart below to help you decide which FE course is best for you! Flexible and Unique to You: It’s tricky to fit studying into your busy schedule, so PPI2Pass offers convenient scheduling and risk free enrollment options that make it easy to prep for your FE exam. Fully Comprehensive Course: While it may seem like a pricey review course, PPItoPass FE Review comes with all the study tools you need to pass the exam with ease. 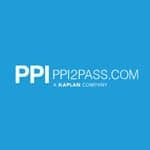 Lots of Student Support: During your entire study process with PPI to Pass, you will be able to communicate with your instructors in class or via email. Strategies for the FE Exam: Not only are you provided with FE study material, you will also be able to learn all sorts of tips and tricks for taking the dreaded FE exam. The Bottom Line: It’s tough to pass the entire FE exam, especially if you have been away from school for a while. PPItoPass offers review courses for all sections of the FE exam; these courses have been helping students pass the FE exam for over 40 years. This course isn’t like others where you are just given a heap of information and expected to study on your own. PPI will be there guiding you throughout your FE exam study process. This includes lots of time practicing in exam-like conditions and reference materials that break down complex concepts. If you chose to go with PPItoPass, you will certainly be over-prepared for your FE exam. It may seem like a high price tag, but there is certainly a reason why it is my number one ranked course. You will certainly be getting your money’s worth as well as everything you need to pass the FE exam. So what are you waiting for? Give them a shot today and you won’t regret it! Exam-Like Practice Problems: Practicing problems takes up majority of your study time, and Capstone Learning has you in exam-like conditions as you practice. Fast and Easy Student Support: You can contact a certified exam instructor anytime during your studies, taking away the stress of getting stuck on certain concepts. Focus on the Important Topics: Your Capstone Learning course will give you just what you need to pass the exam: nothing more. There’s no need to spend extra time studying topics you may have already mastered. Outdated Software: If you want a high-tech course that comes with all the bells and whistles, then Capstone Learning is not for you. This course software is basic, but certainly gets the job done. The Bottom Line: I love how Capstone Learning gives you all you need to prepare for the FE exam. No extra information that won’t even be tested on the FE exam: If you are a student that likes to just practice, practice, practice when getting ready for a test, then this would be a great FE prep course for you. You will have access to student support that is quick to respond and the ability to organize your study plan at your own pace. Check out the free trial on Capstone Learning’s website to check out for yourself! Live Classes: Excel Test Prep offers 6 live classes (each 7-8 hours) that teach all sections of the FE exam, including FE Civil, Mechanical, and Other Disciplines. Passing Guarantee: Excel Test Prep is so confident in its course that it comes with a guarantee. If you go to every class and still don’t pass your exam, you get to take the next class for free. Just make sure to read the fine print on this guarantee before purchasing! Top-Notch Instructors: Excel Test Prep’s instructors come from academia and have industry experience. Each one is highly qualified in their specialized topic, so you are in good hands. Subpar Student Support: Even though this course comes with Live classes that let you communicate with the instructor, it’s tough to find immediate student support. Other courses like PPItoPass have email student support that helps you when you run into questions in the late night hour of studying. The Bottom Line: Excel Test Prep is a great course for you if you have been out of school for some time. The material is organized in a way that provides you with an intensive study plan that will cover everything on the exam. You will be practicing problems that you probably haven’t seen since college. There is also a group sign up discount if you know others that are studying for the FE Exam. Practice Tests from FE Exam Creator: You can purchase a practice exam for each section of the FE exam, each containing questions from old exams. You will be practicing in the same format, style, and level of difficulty as the real deal. Inexpensive: If you are trying to go through this FE license process without spending a lot of money, this is the way to go! Just make sure you don’t need any extra study materials. Return Policy: If you end up not using the practice tests, you can return them within 30 days for a full refund. There’s no risk in getting them now and deciding whether or not you need them in your study journey. Not an “Official” Prep Course: This is a great resource for those that don’t need a full review course or simply don’t want to spend a lot of money on one. You can get the exam materials straight from the NCEES and study on your own, which is prefered for some. But it’s much more difficult if you’ve been out of school for a while. The Bottom Line: If you just want to go straight to the source and practice FE exams, NCEES is the place for you. For a much cheaper price, you can practice the exams and look at general reference material. I don’t recommend this to you if you have been out of school for awhile; in that case, I would recommend PPItoPass or Capstone. However, NCEES could be a great addition to another review course or additional study material!